This useful front-end simplify the command line for the preview of the Real Producer 9 Preview. This new version of the Real Format provides many advantages and has many options to improve the quality of the video image as well as the implementation of Surround Audio. 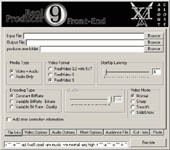 In the download section of our homepage (http://xisoft.web1000.com/) we have the link to download Real Producer 9 Preview.